Recipes and Tips to Make You Love Your Leftovers! We hope everyone had a fantastic Thanksgiving filled with family and delicious food. After everyone’s had their fill there are usually lots of leftovers! Don’t let those tasty dishes go to waste! Here are some tips and tricks to use those dishes and ingredients to make some healthy meals for the rest of the week. Wraps are a great lunch alternative that are very customizable. Take a whole wheat tortilla, add leftover turkey (or use ham or chicken), spinach or mixed greens, sliced tomato, sliced bell peppers, mayo and mustard and wrap it up. This is a low fat, high protein and high fibre lunch for the whole family. Try cutting it up into pinwheels for kids! This healthy and hearty recipe can be made in a snap and uses lots of leftovers at once! No matter what type of rice you have leftover from Thanksgiving, you can always add brown or wild rice for extra fibre. Rice can be used cooked or uncooked for this recipe. In a medium casserole or soup pot, bring stock to a boil. Add rice, garlic, carrots, celery and herbs. Simmer over medium heat with the lid on for 40 to 45 minutes. Take soup off the heat. Add lemon juice and roast turkey to soup, serve hot. Health Happy tip: If any recipe calls for chicken sub in turkey instead! After a big family dinner, there are usually lots of leftover sweet potatoes or mashed potatoes! Mash the potatoes together and fry with olive oil to make potato pancakes. These are crunchy and fun to make. Who says you can’t have Thanksgiving foods for breakfast? This dish will feed a crowd and creates a savory breakfast that everyone will enjoy. Instead of having toast with your morning eggs, have stuffing. Not only is it much tastier, the veggies or fruit in your leftovers are loads healthier than any sugary jelly. Preheat the oven to 450 degrees and grease a baking dish with some oil. Spread stuffing evenly in the dish. Bake for 10 minutes. Cut two small holes in stuffing. Crack eggs into the wells, sprinkle with cheese, and return to the oven for 7 to 10 minutes, until egg whites have set and cheese is gooey. If you have leftover pumpkin puree from making pumpkin pie, put it to good use by adding a twist on classic bannock! Pumpkin is high in fibre and potassium and tastes sweet with very little sugar. Make a well in the middle and add the butter, water and pumpkin puree. Combine well with your hands and form a ball. Turn dough out onto a floured surface and knead. Shape into individual circles or biscuits and place on a greased baking sheet. After Thanksgiving dinner has been enjoyed, it’s important to store your leftovers safely. Here are some tips to keep your dishes safe and tasting great. Your fridge should be set to 4 C or 40 F to keep food cold. Divide large amounts of food into smaller containers and put in the fridge or freezer. 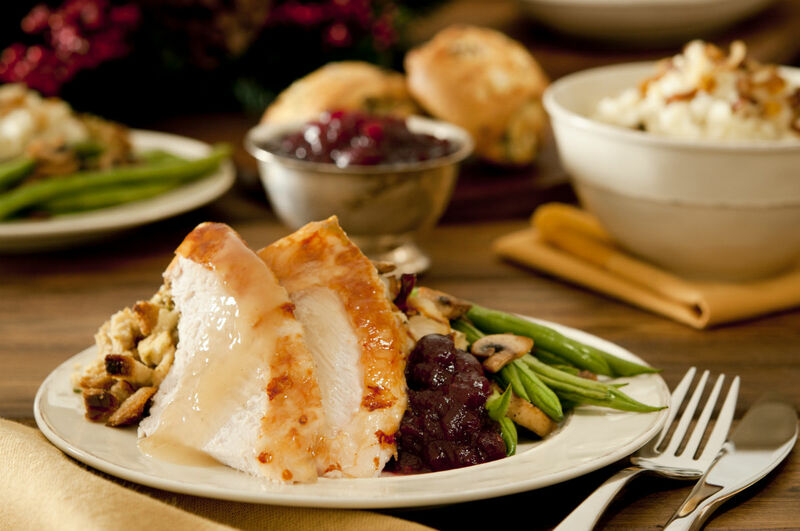 Store leftover turkey in smaller containers and stuffing should be kept in a separate container. Wrap leftovers in airtight packaging or storage containers to keep bacteria out and to prevent food from drying out. Most leftovers can be kept for three to four days in the fridge. If freezing leftovers be sure to label the date and to keep food for no longer than 4 months. Bring reheated soups and gravies to a boil.